Aravinda Mohapatra, cameraman of The Pioneer, Bhubaneswar, allegedly touched the zebra cross on traffic intersection at AG Square at about 12.30 pm on August 14. If he thereby contravened the traffic laws, Police was entitled to prosecute him as laws permit. 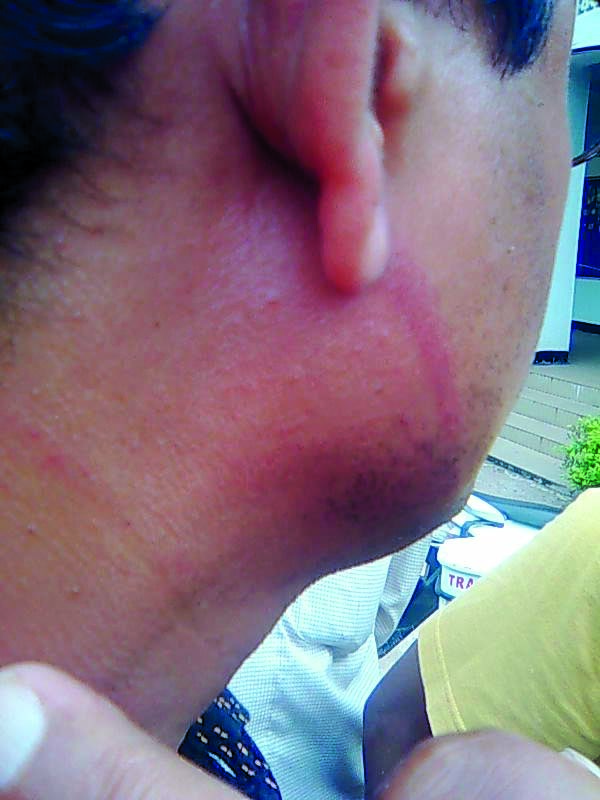 But he was physically brutalized on the spot before the general public. Satyendra Kumar Biswal, a traffic constable, thrashed him and as Mahapatra protested, he snatched away his helmet and huffishly used it as a hammer causing excruciating pain all over his body. 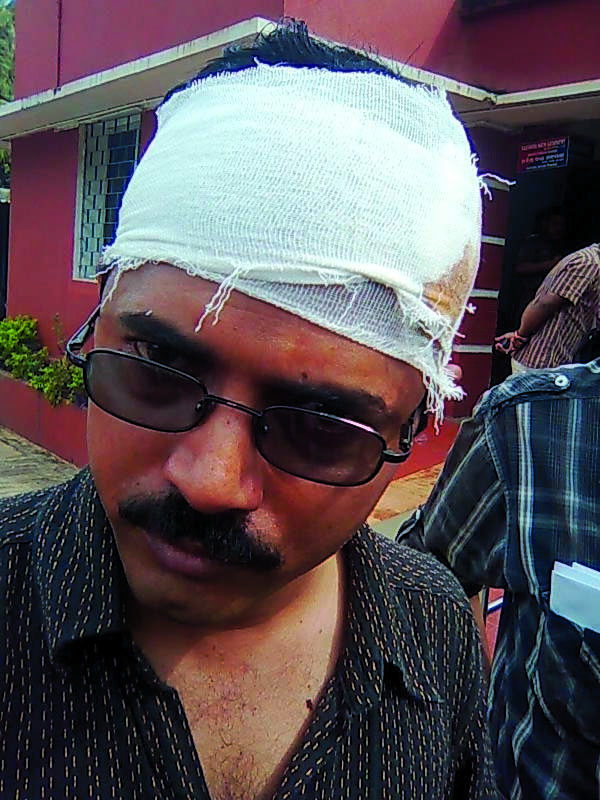 As Mohapatra was following another traffic constable to the nearby Traffic Police Station, Biswal charged him from behind and gave such a brutal blow with the snatched away helmet on the left side of his head above the ear that blood oozed out in the right side ear and in its impact a vein from below the right ear to the lower chin was swollen as if it was going to burst. Public outcry on the spot made the traffic officers whisk away Mahapatra from their Station to the Capital Police Station where two things openly occurred. One, Mahapatra filed a formal FIR and two, on receipt of the same, Capital PS sent him to Capital Hospital for urgent medical examination of his injuries and required treatment and report. As the news reached the media fraternity many of Bhubaneswar based journalists including available members of MUFP Presidium Prasanta Patnaik and Subhas Chandra Pattanayak rushed to the Capital PS. Soon DCP Himansu Lal arrived. He went through the the FIR and asked the P.S. Inspector-in-charge (IIC) to acknowledge receipt thereof on the body of Mohapatra’s personal copy. And, then as he watched the bleeding injury on the head, he ordered for his reexamination by the neuro-surgery specialist of the Capital Hospital which was done. He told the media persons present there that the concerned constable has already been suspended and within half an hour he shall be forwarded to the court for the offense he has perpetrated. And in presence of MUFP functionaries and members of media fraternity, he gave oral orders to the IIC of Capital PS to arrest Biswal and forward him to the court within half-an-hour. The DCP’s orders were just and justice seemed to have been given to the affected news-photographer. All of the scribes and photo journalist present in the PS were quite satisfied with the orders of the DCP and left the PS at about 3 pm sans any more grievance. But in the evening it transpired that the concerned IIC had disobeyed the orders of the DCP and the miscreant constable had neither been arrested nor forwarded to the Court. On the other hand, the affected news-photographer was informed that he would be subjected to a counter case if he insists on action against the constable. It had its intimidating effect. 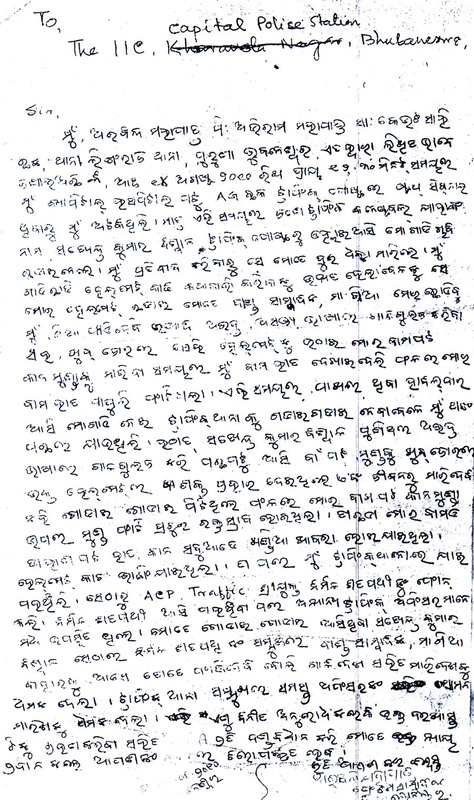 Mohapatra, already in shock and injured, was deeply affected by the alarming words. This led to an impromptu decision of emotionally affected media persons to stay away from Freedom Day events in protest against the obnoxious words used against media community by the miscreant constable over and above his protected brutality. This decision sent shock waves into the nerves of administration and all out attempts were made to fizzle out the protest. Police Commissioner B.K.Sharma came down to the Traffic PS and begged apology for the offenses committed by the constable and appealed to the Press to keep up their cooperation on Freedom Day. And the Press behaved as magnanimously as was expected. The tormenting tension ended at 8 in the evening; but the question remains as to whether it was a police revolt against the just orders of the DCP that necessitated the Commissioner’s coming down to the Traffic PS to somewhat bury the hatchet?